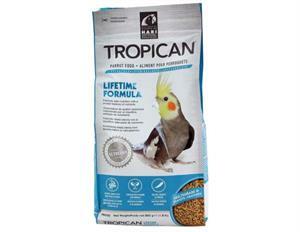 Hagen Tropican Lifetime Granules are a nutritious, tasty daily food. They have a wonderful citrus/ tutti-fruiti essences of orange and banana oils, but are not loaded with sugar and sodium like other brands may be. They are accepted by many birds that are transitioning from an all seed diet. For variety, they mix well with other pellets. They contain no artificial flavors or colors.This granule is 2mm which is a great size for cockatiels, budgies, parrotlets and lovebirds. Ingredients: Corn, soybean meal, wheat, dehulled peanuts, dehulled sunflower seeds, brown rice, canola oil (preserved with mixed tocopherols), calcium carbonate, lecithin, oat groats,dried tomato, flaxseed, L-lysine, alfalfa nutrient concentrate, choline chlorite, DL-methionine, orange oil, banana oil, biotin, vitamin E supplement, niacin, calcium L-ascorbyl-2-monophosphate (source of vitamin C), zinc oxide, manganous oxide, d-calcium pantothenate, vitamin B12 suupplement, rosemary extract, beta-carotene, sopper sulfate, pyridoxine hydrochloride, thiamine monoitrate, inositol, folic acid, vitamin A supplement, calciumiodate, sodium selenite, vitamin D3 supplement.